1 Billionaire is Shorting Caterpillar Inc.'s Stock: Should You? 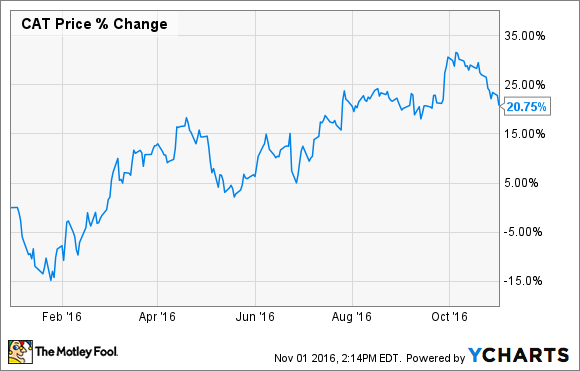 Why Jim Chanos might be right to be bearish about Caterpillar Inc. stock. Just about two weeks ago, during an interview with CNBC, billionaire Jim Chanos revealed that he's short Caterpillar Inc. (NYSE: CAT) stock. Then Caterpillar announced dismal third-quarter earnings on Oct. 25, sending the stock down almost 4% since, as of this writing. Yet do you see how strong the stock has held through the year? It's still up about 20% year to date, reflecting the market's optimism about Caterpillar's prospects. Some analysts are even calling it the bottom -- like Deutsche Bank, which upgraded Caterpillar to a buy last month, placing a 12-month target of $98 on the stock. With such contrasting views, what are the chances Chanos is getting it right on Caterpillar? Caterpillar's dark days aren't over yet. Image source: Getty Images. The collapse has not happened. The unwind has not happened. That's ahead of us, not behind us. If Chanos' fears come true, it could sound the death knell for Caterpillar's turnaround for some years. While Caterpillar doesn't give a detailed geographic breakdown of its earnings, the Asia-Pacific region accounted for 20% of its machinery sales last year, with China counting as a priority growth market ever since the company acquired Bucyrus International in 2011. What's more, a bubble in China is bound to have ripple effects on other economies, which could hit Caterpillar from all sides. What's worrisome is that some of the key global construction markets are already showing signs of stress. Construction-equipment manufacturer Manitowoc Company (NYSE:MTW) recently provided shockingly dismal preliminary numbers for its third quarter, expecting its Q3 losses from continuing operations to more than quadruple year over year on double-digit decline in orders and backlogs for new equipment. Now Caterpillar has downgraded its outlook for the rest of the year for the North American construction markets. The biggest warning signals, however, are coming from Ritchie Bros. Auctioneers (NYSE:RBA) -- the world's largest heavy-equipment auctioneer and a leading used-equipment seller. Ritchie Bros. closed its largest-ever auction last month, selling equipment worth more than $76 million in two days. Caterpillar's crawler pipelayers and tractors dated between 2007 and 2012 were hot sellers. Sure, that reflects Caterpillar's brand power, but rising demand for used equipment even as orders for new machines are drying up is also a surefire sign of troubled underlying markets. An auction under way at Ritchie Bros. Image source: Ritchie Bros. It's brisk business for auctioneers such as Ritchie Bros when equipment manufacturers struggle to sell machines. And that's exactly what's happening now: Construction, mining, and oil and gas companies are putting off fresh purchases and turning to rentals and auctioneers to replace aging fleets as they tighten their purse strings. In fact, there's no bigger evidence of the trend than Caterpillar's own alliance with Ritchie Bros. that it struck in August to provide its dealers a platform to auction old equipment. But China and the construction markets aren't the only problems Caterpillar has to deal with. The company just downgraded its full-year earnings outlook to $2.35 per share, as demand from mining, oil and gas, and railroads weakened. That's half of what Caterpillar earned in 2015. Worse yet, Caterpillar expects its 2017 revenue to be similar to this year's, dimming hopes of a recovery in end markets in the near future. Miners and oil companies are unlikely to revive stalled projects and purchase new equipment unless commodity prices stabilize. No one knows where oil is headed, and industry experts expect iron ore prices to cool off after a massive run-up in recent months. The prolonged uncertainty in end markets has already forced Caterpillar to resort to desperate measures. Case in point: the early retirement of CEO Doug Oberhelman. What can the new CEO do? In a surprising development mid-last month, Oberhelman announced that he'll retire as CEO in January, at least a year ahead of schedule. Not surprisingly, it's largely seen as a price Oberhelman has to pay for some of his decisions over the years that have only worsened things for Caterpillar. The exorbitant Bucyrus acquisition that cost roughly $8 billion at the peak of the mining industry is the biggest example. Oberhelman's bet on mining wasn't wrong, per se; his timing was just unfortunate. Jim Umpleby will take over as CEO effective January 1, 2017. Image source: Caterpillar. For investors, this sudden management shakeup only adds to the uncertainty. Oberhelman is exiting at a critical juncture, leaving the incoming CEO, Jim Umpleby -- currently the group president for energy and transportation -- with an uphill task at hand to steer Caterpillar through the slump. Under Oberhelman's guidance, the company has already been aggressively shutting down plants and laying off employees for a couple of years now. It remains to be seen what else Umpleby can do to keep Caterpillar's head above water. It's a long road to recovery for Caterpillar, and investors might be better off staying away until the end markets improve. With the stock climbing substantially this year and trading at a premium based on nearly every key valuation metric, including price to earnings, price to cash flow, and price to book value, I wouldn't be surprised if Chanos' short bet on Caterpillar pays off in the months to come.